Juan Mata match discussion thread for the 2014/15 season. Him, Herrera and Rooney looked class tonight, also Welbeck. They look very sharp. Probably going to get better. Van Gaal has said it could be 3 months before it really clicks, I think that's more defensively though. Mata been looking real lively on tour. Formation designed to get best out of him. Outstanding first half. Creative hub. Fantastic player. I was very pleased with how he did most of the time last season but he looks a lot better now. The system suits him down to the ground. I was a bit worried for him during the summer when I thought we'd play 4-3-3. Entering his peak years now. The best is yet to come. He's great in this formation. Rooney and Mata have formed a good understanding, will RvP link up as well? I guess we'll find out in about a month. Players like Mata, Kagawa, Ozil etc. are great when the rest of the team is solid. Invisible today. Yeah, was quiet. Needs to offer more. The stats show that play him in the CAM role and he's one of, if not our best player. The criticism he has received has been over the top. The stats show he has stepped up in an under performing team. He needs pace around him though. Playing wide in a 433 is a lot different than the wide role he's played so far with us. Played in a midfield 3 or wide in a 433 for Chelsea under Villas Boas and Di Matteo I believe. Stats only tell so much for me. 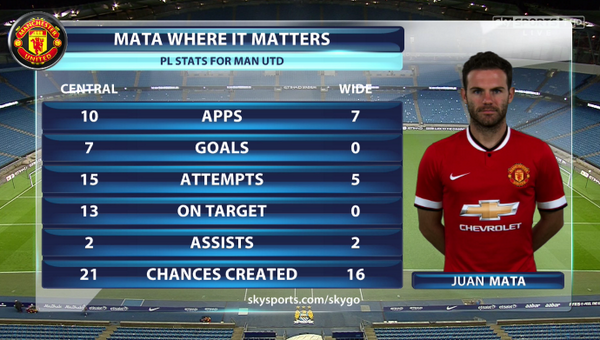 In my view Mata, so far, has been underwhelming both at 10 and out wide. It's early days in his career and he arrived at a bad time last season, but if we don't see an improvement I wouldn't be surprised if Januzaj overtook him as number 10 if we stick with this formation. Anonymous, really poor. Too slow. He was not very good. He seems to be off the boil. Hope the injury is not too serious. Very good and possibly his best performance for United. He is much better when a team has better movement. He and Herrera linked well. 8 goals in his last 10 Premier League appearances. Maybe team took foot off gas but thought we looked weaker with him off the field. 3 strikers fighting it out for 2 places in my opinion. They all need to work together though and not try and 1 up against each other. Hopefully it'll be healthy competition. Out muscled too easily, slow and ponderous. Very quiet and disappointing performance. Rooney's drive and higher tempo at the tip of the diamond was missed. Nothing special today, thought he did well though to be honest. I prefer Mata in the role to Rooney. I prefer Rooney up top though to van Persie at the minute. I think Mata needs to play in a 4-4-1-1 or 4-2-3-1 system. He doesn't possess the physical attributes to cover ground in attack or defence to play at the tip of the diamond. Disagree. Mata more intelligent in where he operates, did a good job off the ball against Barry and Besic, Rooney tends to be all over the shop, and drops too deep for my liking which means the strikers have to drop deeper too. One of the reasons, Welbeck was preferred to him in the role against Real Madrid, was because he wasn't positionally disciplined to sit on Xabi Alonso and would have allowed him to dictate. I thought Mata played too high and needed to drop deeper yesterday, there is less need for him to be as high when two 9s are playing. The 10 in a diamond needs to be a bit more all over the shop. He has been disappointing this season bar the performance against QPR. Rooney has been considerably better in the position. I don't think Mata will start against Chelsea and wouldn't be surprised if he didn't start against West Brom, if we stick with the diamond formation. He doesn't impose himself (he's a bit like Ozil in that respect), he will get assists and goals, but he won't dictate play or be as influential as the likes of Silva or Rooney. I didn't see much difference in the way Mata was positioned and how Rooney has been, they have both played quite forward with the front two going wide. Rooney has had umpteen games where he he has done zero yet delivered a goal or an assist a bit like Mata recently. I would prefer him behind one striker, playing 3 up top is just a way to keep everyone happy. Needs to do more. Quiet, slow and ponderous. Hard to disagree with Gary Neville and Mourinho based on what we've seen so far of Mata's time at United. Poor tonight, no doubt about it. Rarely saw him or van Persie. Great players but not functioning at the minute. He isn't influencing games nowhere near enough, Rooney doesn't have to worry about his spot. A panic signing by Moyes and he will be gone in the summer. He really needs to start doing more. He's had plenty of opportunities. Get used to the bench again Mata, just isn't influential enough.